Give your living room a unique and modern centerpiece. 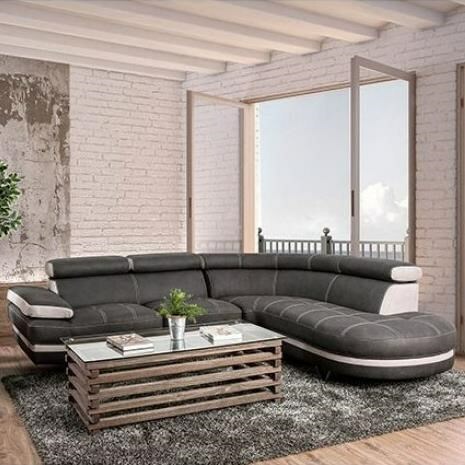 This stunning sectional sofa features a two toned design, including a sleek beige strip along the skirt line. The stitching on the seat enhances the look of the padding, giving the sofa a pillowy visual. Modern additions like metal angle legs, and adjustable headrests and arm rest allow you to customize your comfort and introduce a sense of top of the line product quality. The Picard Contemporary L-Shaped Sectional with Adjustable Headrests by Furniture of America at Del Sol Furniture in the Phoenix, Glendale, Tempe, Scottsdale, Avondale, Peoria, Goodyear, Litchfield, Arizona area. Product availability may vary. Contact us for the most current availability on this product. Browse other items in the Picard collection from Del Sol Furniture in the Phoenix, Glendale, Tempe, Scottsdale, Avondale, Peoria, Goodyear, Litchfield, Arizona area.